The House majority whip was shot multiple times in 2017. When Rep. Steve Scalise was practicing baseball for the annual congressional charity game in June 2017, he thought he heard a car backfire. But the next time he heard the noise on the field in Alexandria, Virginia, he knew something was seriously wrong. "You're not thinking there's a shot being fired. The second shot, I knew it was gunfire, and the third shot I was hit," Scalise, R-Louisiana, said on "The View" today. Scalise said "my legs gave out" and he started to crawl away. "I could tell it was coming from third base -- I'm on second base," he said, adding that he tried to crawl as far as he could before he was unable to move any further. "I just started to pray. I put it in God's hands. I said 'God, please don't let Madison have to walk down the aisle alone,'" he said, referring to his daughter. "I just felt this incredible calm come over me," said Scalise, who has written about the experience and the aftermath in his new book, "Back in the Game." 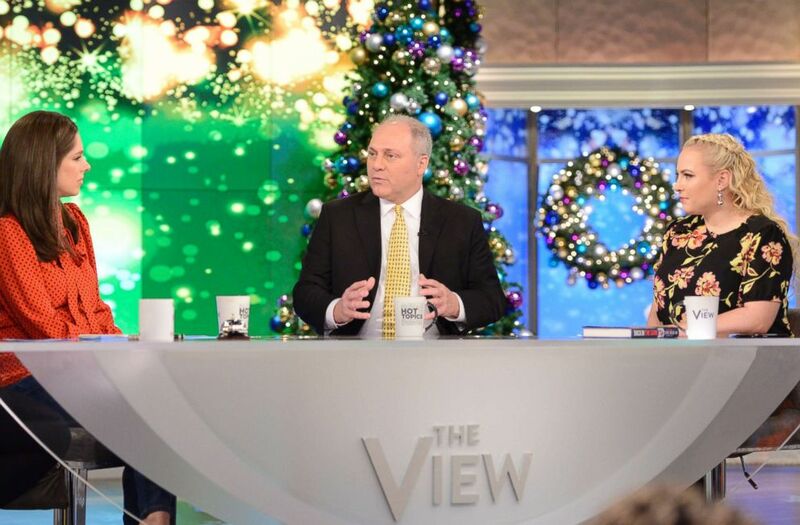 (Lorenzo Bevilaqua/ABC) Rep. Steve Scalise on "The View," Dec. 4, 2018. Scalise was the only member of Congress hit in the shooting on June 14. His protective agent U.S. Capitol police officer Crystal Griner, congressional aide Zach Barth and lobbyist Matt Mika were also injured. The suspect was shot in a firefight with Scalise's protective detail and he later died from his injuries. He said that there were "many miracles on that field," and praised the work of his colleague Rep. Brad Wenstrup, of Ohio, who previously served as a combat surgeon in Iraq. Scalise said that Wenstrup saw him crawling and knew what to look for. "He's watching me and he's looking for movement," Scalise said. "As soon as the shooter went down... Brad comes over to me. He sees that there's an entry wound but no exit wound," Scalise said, adding that Wenstrup applied a tourniquet that may have saved Scalise's life. "My trauma surgeon told me if that tourniquet wasn't applied just perfectly... I wouldn't have made it to the hospital," Scalise said. (Bill Clark/CQ Roll Call/Getty Images) House Majority Whip Steve Scalise, R-La., walks with his wife Jennifer from the House chamber to his office in the Capitol on his first day back in Congress, Sept. 28, 2017. Scales was shot during baseball practice for the Congressional Baseball Game in June. 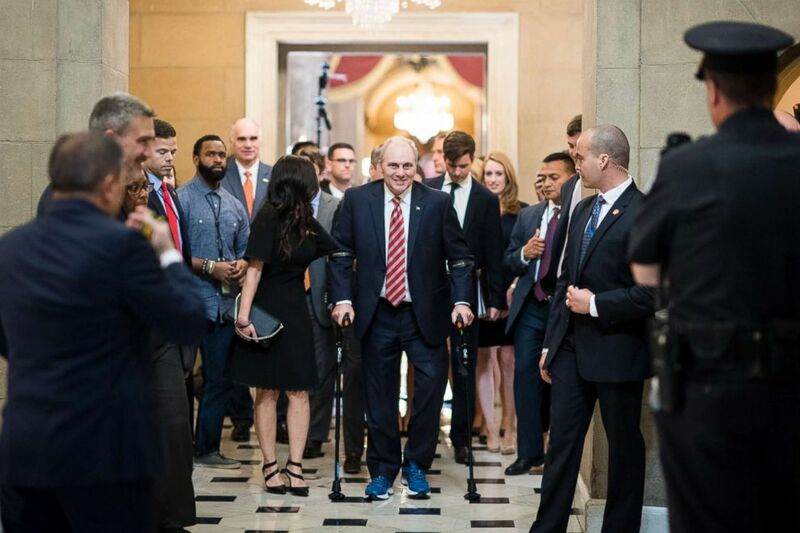 Scalise went through a series of surgeries after arriving at the local hospital in critical condition and, after several months recovery, he was met with a standing ovation when he returned to the House floor in late September. "It was one of the most special moments of my life... to be able to come back," he said, adding that his wedding and the births of his children also fit that superlative. "I wasn't sure if I was going to be able to come back to work." "To see my friends, Republican and Democrat... to see that warm reception, it meant so much to be able to do that again, when it was a question," he said, adding that "there are real friendships you can form" between members of different political parties.